While on vacation with my family in New England this summer, I had the joy of visiting the Umbrella Cover Museum in Peaks Island, Maine. Why would someone visit a museum dedicated to only umbrella covers? That’s a good question, but the more important question is what can be learned from my visit to the Umbrella Cover Museum. First, a bit of background. My family and I were visiting several New England states for vacation this year. In my planning for the trip, we decided to go to Portland, Maine, for the day. I still love to get state travel guides in the mail, so I ordered one for Maine hoping to find some interesting places to visit in the Portland area. 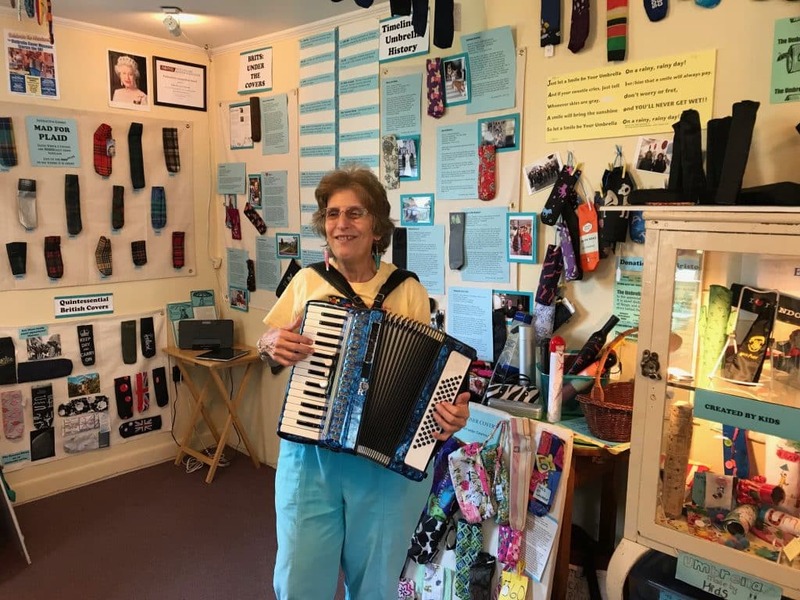 They mentioned that there was a Guinness Book of World Records collection at the Umbrella Cover Museum in the Portland area. After reading that, I had to visit their website. Once I did, my family and I were hooked and added this tiny museum to our itinerary. It did not disappoint. 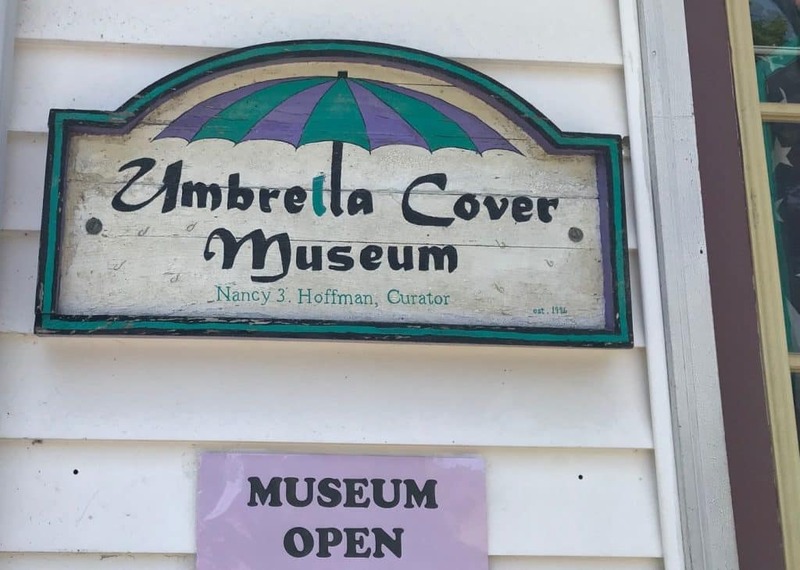 In fact, I was so inspired by the visit to this tiny, all-volunteer museum that I had to share five lessons we history/museum people can learn from the Umbrella Cover Museum. Make Visitors Care about Your Mission. The first thing that grabbed me on the website was their mission. “The Umbrella Cover Museum is dedicated to the appreciation of the mundane in everyday life. It is about finding wonder and beauty in the simplest of things, and about knowing that there is always a story behind the cover.” I love this mission. It is not about preserving, collecting, or educating visitors about umbrella covers. 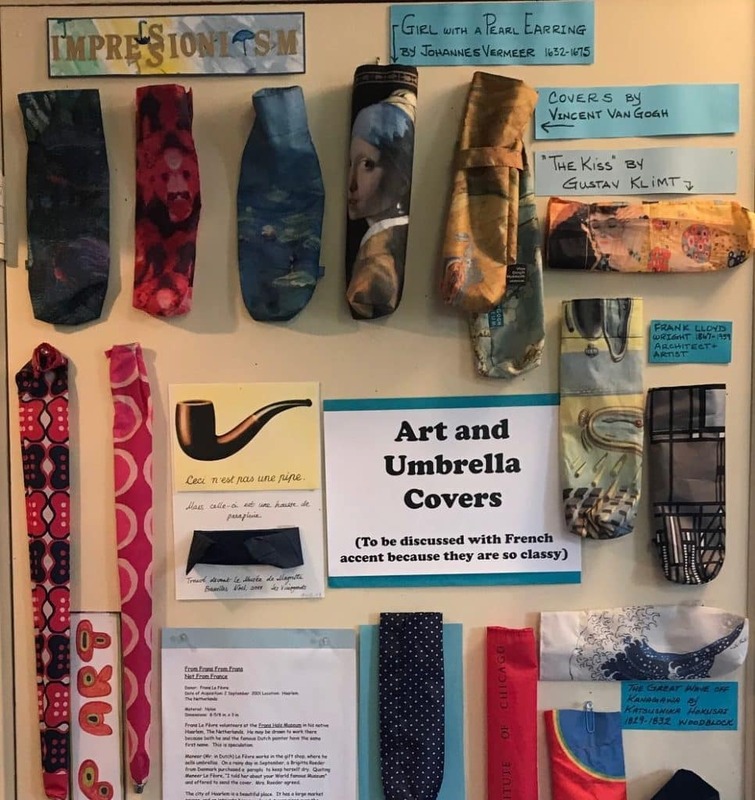 It is about using their collection to help people find “wonder and beauty in the simplest of things.” It is a mission that makes you want to care about umbrella covers and what they represent. And the curator, Nancy 3. Hoffman, starts her tour of the one and a half room museum by asking visitors to read the mission aloud. It put the mission at the forefront of the rest of the tour and made us care about this weird collection. Is your mission prominently displayed in your museum? Do your interpreters reference your mission on tour? If not, why should visitors care about your mission? People Make a Difference in Experience. Before we visited the Umbrella Cover Museum, we visited a large art museum in the New England area (not in Portland). During that visit, my twelve year old son scared his sister by quietly hiding behind a wall in a gallery and she made a loud noise and we laughed. Two guards followed us for the rest of our time in that particular gallery making us feel uncomfortable in the space. As a result, we just hurried through the rest of the museum leaving with a bad feeling and not wanting to return. Nancy gave us a completely opposite experience. To be honest, we were the only people in the museum at the time, but she was warm and welcoming. She spoke to all four of us individually and made us all feel included. She also was passionate about her topic and made us care as well. We need to train all of our staff to be open and welcoming to all people who come to our museum. Most people who are offended may not tell others about their bad experience, but they will not return nor will they encourage others to visit. On the other hand, visitors who feel warmly welcomed will tell their friends (or share their experience in a blog post). Know Your Limits. This is one of my favorite things about this museum. The Umbrella Cover Museums knows who it is. It doesn’t try to be anything else. For example, the website tells of the founding of the museum when “People flocked by the tens to see the museum.” I love that they acknowledge upfront that they are not going to have thousands of visitors. They are located on Peaks Island which is only accessible by a 20 minute ferry ride from Portland. You have to be going to the island to get there and we are probably the only four people who ever went just to see this museum. They realize that and they own it. They also know that their museum is quirky (it is on the sign outside the building). They embrace it and this helps visitors know it is ok to think that this museum is weird. You won’t hurt Nancy’s feelings because she knows it too. Does your museum need to set limits? Think about how you present yourself to visitors. Does it truly represent the culture of your organization? If not, what can you change? Engage Your Audience. Part of the experience of the Umbrella Cover Museum is the guided tour by curator Nancy. As I mentioned before, she made a point to engage all members of my family with questions during the tour that were appropriate to our ages (the kids are 12 and 17). If you answered a question correctly, you received a tiny cocktail umbrella. She also kept us engaged by changing up the tour. When she talked about British covers, she used a British accent. When she got to the art inspired covers she used a French accent “because it is classy.” She also ended the tour with a delightful accordion sing-a-long of Let a Smile Be Your Umbrella, the museum’s theme song. Now, I don’t recommend this technique for most museums. Again, you have to know your limits. But, I do encourage you to train your interpreters and volunteers on how to engage with different types of audiences. Too many museums develop tours or other interpretation for “the average visitor,” but that leaves a lot of people feeling bored or left out. Think about how you can adapt experiences on the fly for different visitors in a way that will leave them feeling delighted with their visit. Know Your Collection. This tiny museum has over 1,000 umbrella covers in its collection. But, Nancy knows what she doesn’t have. When she found out we were from Tennessee, she pointed out the fact that our state is missing in her collection and gave us a donor form (which includes an opportunity to donate money to support the care of the collection) in case we wanted to send her a cover. She will be receiving a cover from Tennessee soon. This is an area where we are not proactive enough in the history field. Many museums only add to their collection when something gets dropped off at the front desk. This makes us community attics. All institutions need to have a Scope of Collections Statement or Collections Plan that can help identify the stories we need to be telling about our communities and identifies the objects we need to acquire to tell that story. It also helps us turn down that tenth spinning wheel that will just take up space in storage. In conclusion, we can’t limit ourselves to learning lessons from large, well-known institutions. They have lots to teach us, but don’t know everything. Get off the beaten path and visit that small, volunteer-run museum. They can often be more creative and experimental than large institutions and can give us lessons to take back to our organizations no matter what size. No organization is perfect and we can nitpick details, but, if we are open to the journey, we may leave with a lesson that can improve our visitor’s experience and help them find the wonder and beauty in our stories.